America the Beautiful is in its sixth year of production, and the US Mint continues to commemorate the beauty and wonder of the nation with the Blue Ridge Silver coin. The third coin released during the 2015 production schedule, the 2015 5 oz ATB Blue Ridge Silver coin represents the state of North Carolina in the series. Now, you have the chance to make a major investment with the purchase of the 2015 5 oz ATB Blue Ridge Silver Coin Monster Box from Silver.com. Each coin in the box consists of five ounces of .999 fine silver. 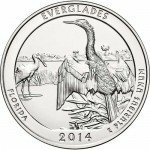 All coins are in Brilliant Uncirculated condition. Total of 500 oz of .999 fine silver available! Ships in a US Mint sealed Monster Box. One-time design representing the state of North Carolina. Struck by the United States Mint. Approved for inclusion in Precious Metal IRAs. North Carolina’s Blue Ridge Parkway is a 469-mile highway that connects North Carolina and Virginia across 29 separate counties in the Blue Ridge Mountains, a major chain within the greater Appalachian Mountain Range. The Parkways is not technically a national park, but it is administered by the National Park Service and has been the most visited unit within the system every year since 1946 (except 1949). This special product listing from Silver.com features the 2015 5 oz ATB Blue Ridge Silver Coin in a US Mint Monster Box. Included inside the Monster Box are a total of 100 individual coins. Each of these 2015 5 oz ATB Blue Ridge Silver Coins are packaged in groups of 10, and placed within 10 individual tubes to reach the total count of 100 coins. On the obverse side of all ATB Silver Coins you’ll find the familiar left-profile bust of President George Washington featured on circulation quarters in the US. The reverse bears a unique depiction of the Blue Ridge Parkway in North Carolina, with a small stretch of road emerging from a mountain tunnel along the highway. America the Beautiful quarters are struck at the Denver Mint and Philadelphia Mint in the US Mint system, with a total mintage for this coin is 35,000. If you have questions, please feel free to call a Silver.com associate at 888-989-7223. You can also reach out online using our web chat and email services. 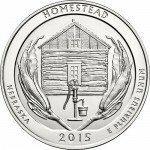 If you are interested in similar products, be sure to check out our full selection of America the Beautiful Coins.